Apple is supposedly making a long play for augmented reality systems that one analyst believes will potentially pivot on the company's current push into fashion, an initiative set to bear fruit with Apple Watch in April. Sony's prototype augmented reality glasses. Citing sources within the virtual and augmented reality industry, Piper Jaffray analyst Gene Munster said in a report published Wednesday that he believes Apple is fielding a small team tasked with experimental work in the AR space. Consumer oriented AR systems are likely ten years out, the analyst said, but Apple's purported involvement suggests it is already plotting out the next evolution in computing. Munster suspects AR technology could be as transformative to the tech landscape as the smartphone. 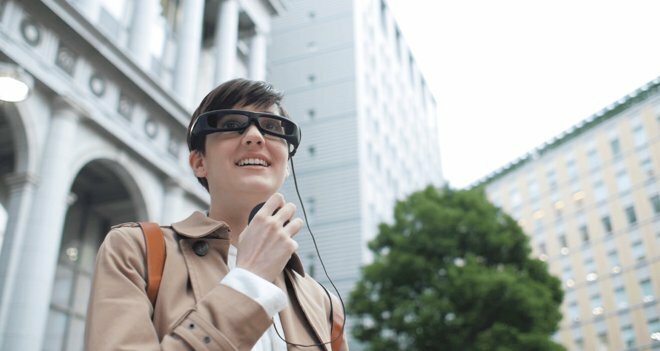 Augmented reality can be explained as layer of digital information overlaid onto the physical world, a good example being Google Glass. Such technology can help augment everyday life in any number of ways, from providing instantly accessible navigation directions to displaying a recipe in the kitchen. It is unclear what format or platform Apple is looking to implement —glasses, headsets, transparent displays —but the company's "evolving fashion advantage" could result in a product consumers actually want to wear. Style is key to wide adoption, Munster said, adding that recent Apple hires from the world of fashion offer clues as to where the company is headed. Over the past year, Apple collected executives from fashion houses around the world, including SVP of Retail Angela Ahrendts (former CEO of Burberry), VP of Special Projects Paul Deneve (former YSL chief), director of marketing Marcela Aguilar (former GAP executive) and star designer Marc Newson. If Apple manages to make a stylish AR device, assuming it plans to go the wearables route, it would be a huge advantage over present devices. At this stage, products range from bulky prototypes to awkward looking gear taken from the set of a sci-fi movie. Aside from wearables, another area of interest in the AR space is light field technology, which merges digital and real world objects through a collection of optics, displays, sensors and other intricate components. An example implementation could soon be revealed by secretive startup Magic Leap, as the firm owns patents that describe techniques of using light field tech to create extremely realistic, interactive three-dimensional images. Magic Leap recently closed a $524 million funding round led by Google. 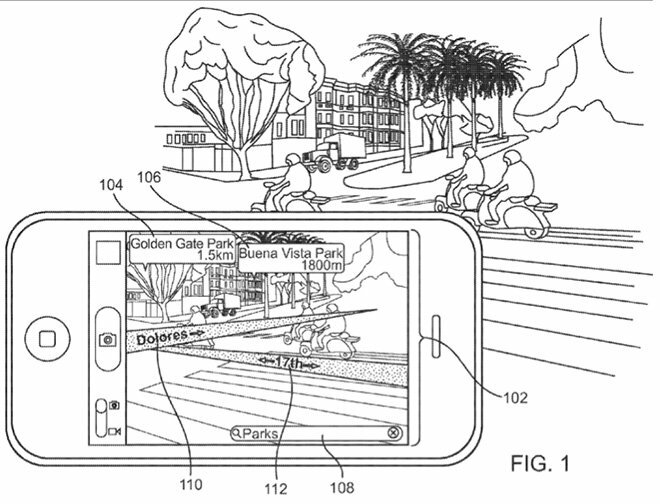 Apple itself holds a variety of patents covering a wide gamut of augmented reality applications, including transparent displays, mobile mapping solutions and iPhone-powered virtual displays. One particularly interesting property details a smartphone that can identify physical objects in real time using computer vision. Munster importantly notes augmented reality and virtual reality are not one in the same. Compared to AR, virtual reality is more immersive and in some cases completely replaces the physical world with an alternate universe, an extreme example being the world created in the movie "The Matrix." Video game developers have been working on virtual reality applications for decades, but only recently progressed to a stage where fairly convincing environments can be recreated with head-mounted equipment. Among the frontrunners in head-tracking VR tech is Facebook-owned Oculus Rift, which is seeing competition from Samsung's Gear VR and Sony's Project Morpheus for PlayStation 4. Whether Apple has a team dedicated to AR applications is at this point rumor, but job postings from February lend credence to Munster's claims. One ad sought a display systems engineer to work on hardware and software for virtual reality environments, while two others asked for AR/VR programmers for software and hardware engineering duties.